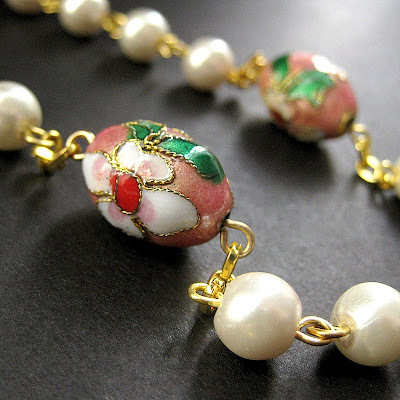 When I saw these beautiful pink egg-shaped cloisonne beads, I was immediately inspired to make something with pearls to match and that's how this rosary was born! This rosary is created using glass pearl Aves in a creamy shade of white are joined with beautiful floral cloisonne cherry blossom Pater beads in pink on this lovely 5-decade pearl rosary that's then brought together with gold plated accents and 100% hand-turned links. I feel that in such an important piece as a rosary, being handmade holds special significance, creating a personal touch and attention to detail that commercial rosaries lack. Every one of the 132 links on this rosary have been carefully turned by hand. The rosary is then finished off with a gold plated wreathed Mary centerpiece and a detailed gold plated crucifix at the end. The length is 22.75-inches (55.8 cm) in length from "nape" to tip. I love personalizing my stuff. I have pins that I attach to my backpack for each season (and half season), little charms to dangle from my purses and wallets and I'm one of those people that has a shiny dangle hanging from my rear view mirror in my car too (mine's a jade, pearl and crystal combo right now). That was why I started making zipper pulls and charms. I could never find what I wanted for these little personalized bits. This one is one of my recent favorites, made with a beautiful 15mm large white pearl is off set by the shimmer of a faceted glass crystal bead in blue on this beautiful charm finished with gold plated accents. 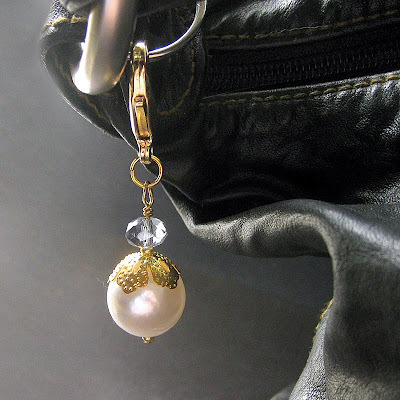 This pearl and blue crystal charm is photographed attached to one of my purses, but it can easily be attached to a phone, zipper pull on a sweater or jacket, key chain, wallet or anything else that needs a bit of decoration. It can even be used for a rear view mirror dangle for your car! The charm is sweet and small at 1.25-inch (32 mm) in length. Sometimes when I have to sit in a waiting room somewhere, I can't concentrate on reading. I usually bring along a little project (when I remember) to do, just in case. I keep the supplies and tools for the project neatly and protectively tucked away in a pencil case in my bag for the day I might need something to keep my hands busy. The other day was one of these days, and this beaded cluster bracelet is the result. The soft, warm glow of silken pearls in shades of cream, caramel and deep forest green combine with the earthy tones of rhodonite rounds this charm bracelet. 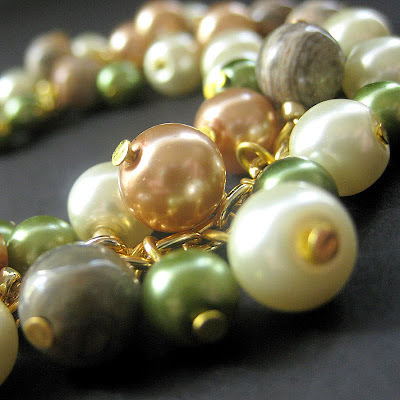 Filled with a cascade of colors reminiscent of a peaceful forest glen on a sunny day, this bracelet overflowing with clusters of glass pearl beads and gemstone rounds on a gold plated chain. The entire piece is then finished off with a gold plated toggle clasp. This bracelet is 8" (20.5 cm) in length including clasp. My cat likes to chase bubbles. If you haven't tried this game with your cat and she's still spry enough to be interested, I highly suggest it. It's loads of fun and costs mere per play-time. 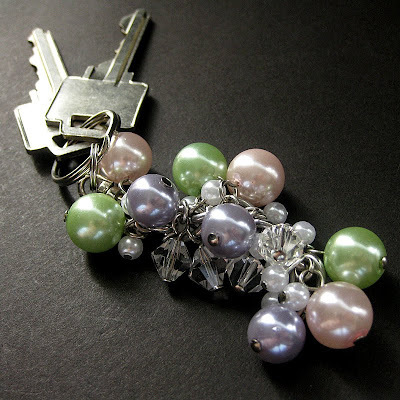 Blowing bubbles is the inspiration behind this handmade beaded key ring, too. Made from a blend of soft shades in lavender, pink and sage green pearls, I added the shimmer of clear crystal glass accents and clusters of tiny white pearls. All joined together, I love the result. It's a soft shaded bounty that makes a perfect charm that can be used not just as a key ring but also as a festive decoration for your purse, phone or car's rear view mirror. This charm measures in at 3.34-inch (8.5 cm) in length.